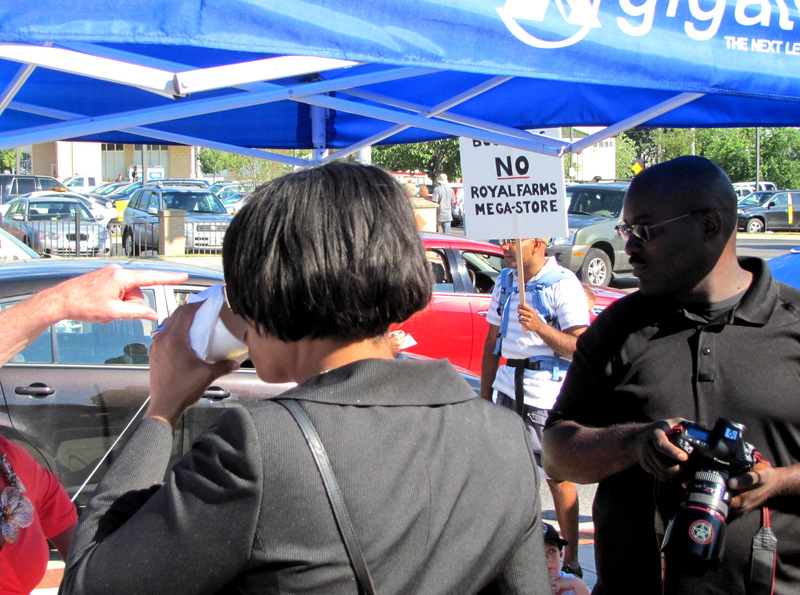 Above: Mayor Rawlings-Blake sips a drink at the Hamilton-Lauraville Market this evening as opponents of the Royal Farms mega-store picket on the sidewalk. 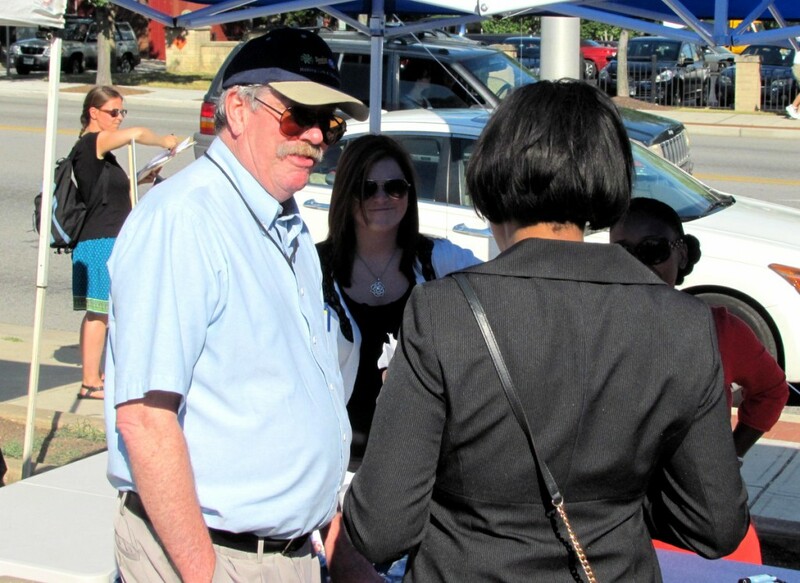 Residents opposed to a Royal Farms mega-store in Northeast Baltimore brought their protest to an event staged this evening by Mayor Stephanie Rawlings-Blake to promote her Main Streets initiative. 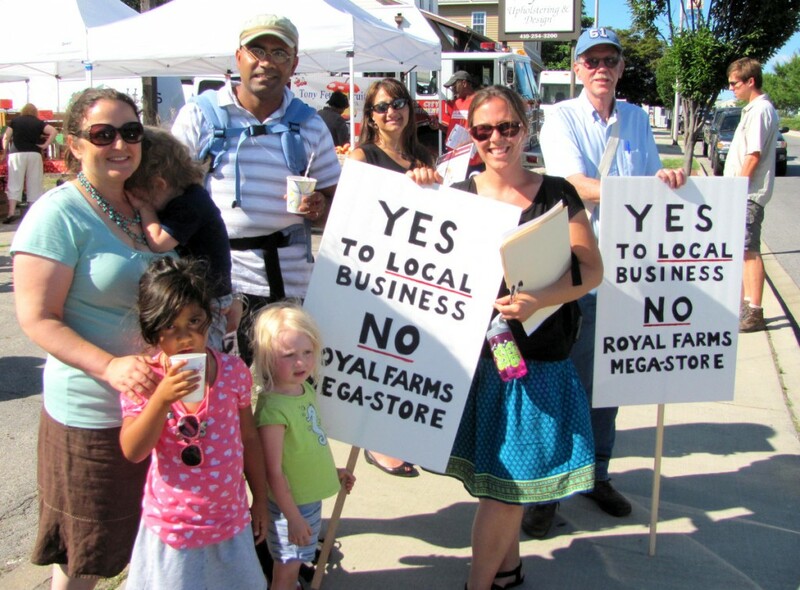 As the mayor strolled among jewelry, organic juice and body-care stalls at the Hamilton-Lauraville Tuesday Market at 4500 Harford Road, a dozen residents quietly held up signs protesting a proposed Royal Farms convenience store up the street. John Reuter, president of the Westfield Neighborhood Improvement Association, said the proposed 5,100-square-foot store – with 14 fueling pumps and 74 parking spaces – represented everything that was detrimental to healthy neighborhoods and would put local merchants out of business. “We’re trying to make this [plan] go away, but a lot of powerful interests are behind this,” he said. Another Westfield resident, Nicci Eisenhauer, said her organization, the Harford Road Community Collective, has gathered 500 signatures against the plan. The Brew wrote about the controversy last week. Saying “I’m a fan of Rawlings-Blake,” Eisenhauer said the groups had no intention of disrupting tonight’s event, which she lauded as making the area more livable and friendly to local businesses. City Councilman Robert Curran, who represents the district and supports the project, said the protesters have no legal grounds to oppose a convenience store at Harford and Glenmore avenues because it is zoned for such use. He said the real issue is the number of gas pumps at the store, which would require approval of a conditional use. The mayor did not comment on the zoning dispute and did not attempt to speak to the protesters, who remained on the sidewalk. The Baltimore Development Corp. (BDC) leases the site to the Hamilton-Lauraville Main Street organization for community events, including the Tuesday Market, which is in its fourth year of operation.